Formulating a model to decrease our odds of being bitten by a venomous snake in the desert SW has been frustratingly difficult. Interviewing people, reading online, and scrutinizing nature exhibits intermittently over the last year left me with a confused and muddled view. But 3 snake encounters in a little over a week in the spring of 2012 in Arizona, one that was definitely with a very toxic venomous species, suddenly gave us a lot of clarity about what we believed to be true. We spent hours reading even more about snakes after those 3 encounters and finalized out our own personal strategies. What follows are our conclusions about how to stay as safe as possible in snake territory when hiking in the desert SW. 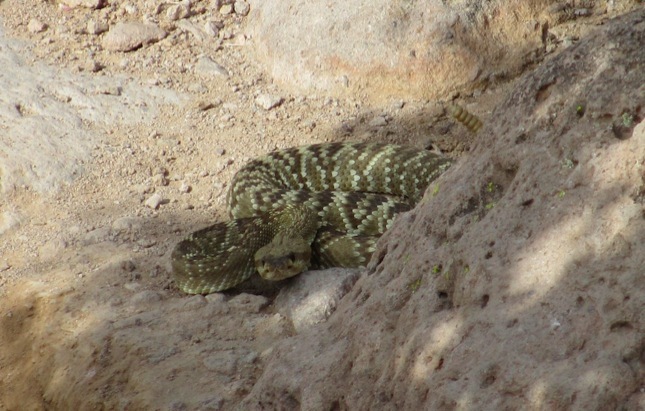 It doesn't take long to learn that in the desert SW of the US, rattlesnakes are the big snake hazard and that rattlesnake talk breaks these pit vipers into 3 groups: Mojave Greens, Western Diamonds, and all others. The Western Diamond is the most mentioned, seemingly because it ranks high on the scale for both the frequency with which it is encountered and its aggressiveness. However if you mention you saw a Mojave Green to someone carrying on about Diamondbacks, the intensity of their discourse jumps up an order of magnitude to emphasize the meanness, the badness of the Mojave's, and then they won't talk about anything else. At least part of the Mojave's reputation is based in fact because their venom is especially toxic, some saying 10 times more toxic than a Western Diamondback. The Mojave's have a special neurotoxin in their venom, in addition to the standard-issue rattlesnake hemotoxin, though the neurotoxin is infrequently found in the venom of other rattler's. (Colloquially, 'rattler' is pronounced with a very soft "t" unlike the hard "t" in "rattle"). You are almost certain to hear the word "aggressive" used in the first sentence or 2 when the talk turns to Mojave Greens and it will also be mentioned in carrying's on about Diamondbacks if Mojave's aren't being discussed, but we disagree. We think that it is more useful to think of both of these snakes as being assertive, not aggressive, though we haven't personally encountered a Western Diamondback. This deadly Mojave Green was ready to strike Bill. My electronic dictionary defines aggression "as the action of attacking without provocation," which fits with my thinking about aggression. Assertive is defined by it as "having or showing a confident and forceful personality" which we think is a better fit with these snakes. A year ago when we made our first 2 month hiking trip to the desert SW I read everything I could find on rattlesnakes and worked hard at collecting snake stories from local people. Early in my self-directed study I decided that the very dangerous Mojave's were getting a bad rap: men taunting them wrote about how aggressive the snakes were but in my mind it was the men who were being the aggressors, not the snakes. The men were intentionally and protractedly putting the snakes on the defensive and then labeling the snakes as aggressive. Thinking of Mojave's as assertive, not aggressive, was validated during our first and hopefully only encounter with a Mojave Green. The snake was positioned on the edge of a very popular hiking venue east of Phoenix, AZ, above Lost Dutchman State Park. As Bill unknowingly approached the snake that was hidden from his view by a boulder on a narrow segment of the trail, the Mojave assumed a low striking position, shook its rattle that was held high, and hissed but did not strike. Bill had unwittingly invaded its space and the snake was quick to defend it. We were terrified but the snake's behavior did not register as being aggressive, only assertive. In our very limited experience, making the distinction between assertive and aggressive could be key to successfully extracting yourself from a dangerous snake encounter. Based on what we'd heard and read, Bill suggested we move out of the view of the Mojave to let it relax. We backed up to a point where we couldn't see the Mojave but from which we could see if it moved onto the trail, which would help us judge the safety of passing by the spot if the snake gave up its position. We arbitrarily settled upon giving it 5 minutes of private time before we peeked to see if it had moved and amazingly, 3 minutes was enough. At the 3 minute point it extended its head onto to the trail, paused in full view of us, and then slowly proceeded to cross the trail. Giving up its position in such a short time when we de-escalated the situation by no longer being confrontative reinforced our opinion that it was only being assertive. The often-told stories about these snakes are consistent: frontal stare-downs can go on for hours. The snake readily moved on when no longer confronted. 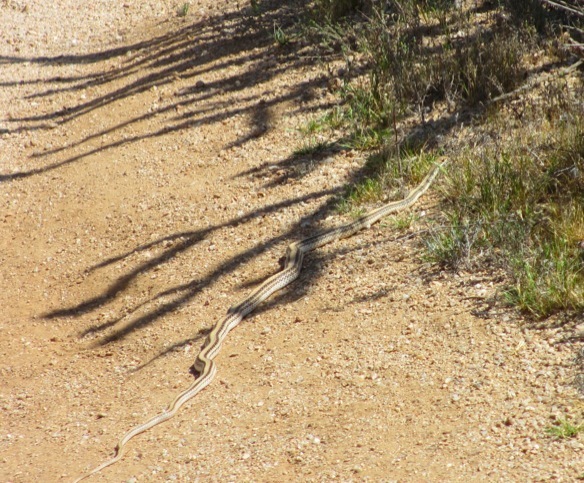 We alerted approaching hikers to the presence of the snake in its new, more obscured position and the silver-haired men that should have known better slipped into their best juvenile behavior and began taunting the snake with a walking stick. The snake obliged by hissing, rattling, but not striking despite repeated prodding by the men. "Two out of 2" in my mind with this particular snake in demonstrating assertive, not aggressive, behavior. Chasing the men or us down the trail would definitely qualify in my mind as being aggressive. But the stories of encounters are all the same: the Mojave's hold their ground but don't pursue, though I can imagine once they start striking it feels like a pursuit. So, like most threatening animals in the wild, knowing "when to hold 'em and when to play 'em" matters. Retreating, being passive, and being non-confrontational looks like the winning strategy to us with these assertive venomous snakes--from a safe distance. 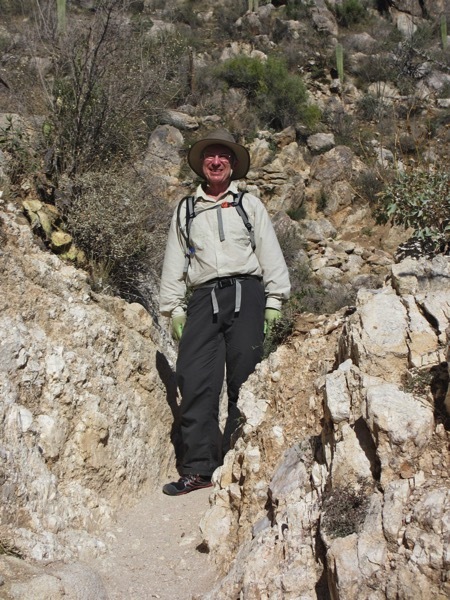 Bill's situation on the trail was curious in that the Mojave was instantly defensive when Bill approached whereas the stories are that even venomous snakes will often let you pass-by if they perceive that they are unnoticed. We are guessing that the oncoming hikers we saw a few minutes prior had, perhaps unknowingly, riled the snake and that Bill was paying the price for their mere presence on the trail. This "#2" theory was another blow to my assumption that the odds of being bitten by a snake were indirectly proportional to the traffic on the trail so that the more people, the lower the odds of an encounter. I really wanted to believe that trail traffic cleared out the snakes, but that wasn't fitting with our experience. Inexplicably, a nonvenomous snake like this crossed the path between us. The week prior to our Mojave encounter a presumed non-venomous snake darted across the trail directly before me when I was walking 15' or so behind Bill. And our Mojave was sighted on the lower, most heavily-traveled end of a very popular hiking trail close to the Phoenix city limits. And I recently read an online opinion that it is the second walker in a twosome that is most likely to be struck, again presuming that the first person startles the snake and the second person registers as a direct confrontation to its safety. Our current assumption is that the leader and the follower on a trail must be equally alert to the presence of snakes, regardless of how many other hikers are traversing the track. In our minds, constant vigilance on the trail is required when the snakes are no longer semi-hibernating in the desert SW but knowing what to look for can be difficult to determine. A ranger at one of the Phoenix area parks had the best model: snakes will be stretched out in open spaces when they are trying to warm themselves and they will be folded under a bush or rock when they are resting or waiting for prey. So that's what we scan for: a stick or branch-like presence on the trail, a neat mound in the vegetation along side the trail, and either configuration on top of rocks. At this ranger's park, McDowell Mountain Regional Park, that has 50 miles of mountain biking and hiking trails, reports from mountain bikers that have run over Diamondbacks are common. No doubt these snakes headed out of the bush, found the warm, sunny opening on the trail, and immediately stopped to bask. Mountain bikers whipping along on the rough trails don't even see them in time to stop. The ranger commented that only 1 biker had been bitten and it was her assumption that he was "#2", that another biker had run-over it or had come too close and like with Bill, the snake asserted itself with the 2nd intruder. We are guessing that snakes criss-cross trails rather than travel the length of trails, though that is only an assumption. Snakes aren't tracking scent like coyotes, so trails probably mean nothing more to snakes that a superior open spot in the brush for sunning. So we are on high alert for anything crosswise on the trail, which means we frequently jolt at the sighting of small branches. We carefully look at the ground with each foot step and scan about 3-4' to each side as well and examine each rock before placing a hand on one for balance. As much as possible, we try to keep our hands close to our bodies and reach out cautiously when needed for stability or when scrambling through rocks. One physical feature that stands out in my mind about rattlesnakes is their heavy body. The nonvenomous snakes we spotted, common garter snakes, and even venomous coral snakes are hose-like in their shape. In contrast, rattlesnakes seem flat-bottomed to me because their cross-section is more horseshoe-shaped than tubular. They really look like they are built to hold their ground rather than dart away, which helps a bit in differentiating them from debris when scanning. "If rattlesnakes are nocturnal, why are so many encountered during the daytime?" had been my persistent and unanswered question that I finally got an answer to: it's all about the temperature. Like me, rattlesnakes have a definite comfort index. Temp's in the 40º's keep them sluggish and at home in someone else's burrow. Once it hits 60º, they will be out and will be most active when the temperatures are in the 80's to 90's. Hotter than that, they start retreating again because 110º can be fatal to rattlesnakes. What's ideal varies a bit with the size of the snake, with a heftier one needing a warmer day to fully heat its mass than a young, slender one. Knowing the preferred temperature range of the snakes makes it easier to predict the likelihood of an encounter at any time of year. An unusual warm spell of several days in the dead of desert winter will be enough to invite a few smaller rattlers out of their burrows, especially if they have a nice south-facing crevice or hole. And likewise, they are more likely to be out on an exceptionally warm evening in the spring than one in which the temperature plummets with the setting sun. In the spring and fall, one is more likely to sight a rattler in the daytime than in the evening; in the summer their crepuscular (dawn/dusk) and nocturnal preferences will prevail. Their favorite foods are nocturnal, which also creates a bias towards after-dark activity. And it's warmth that invites rattlesnakes to linger on asphalt in the evening and after dark, with sun-heated pavement radiating warmth hours later into the night than the soil. So though we are vigilant about watching for snakes hidden in the grass, I've also given up my pastime of walking on campground roads at night without a flashlight shining in front of me: we've heard too many stories from local people about seeing rattlesnakes on the asphalt roads in their headlights. Last year a Phoenix-based friend recommended watching for the appearance of lizards on the trails in the spring: once the weather is warm enough for the lizards to be active, the snakes soon will be coming out of their semi-hibernation. It's advice we continue to heed. We only run in rattler territory if we have a good view of the trail. Why Make It Hard To Be Safe? One of the most foolish things we've observed on the desert trails during snake season is listening to tunes via earplugs while hiking. Rattlers only warning before striking is hissing and rattling so it seems foolish to drown out their courtesy alert system. Trail running with earphones is worse: not only can you not hear their warning but you may be going too fast to stop after spotting one on or near the trail, if you see it at all. Walking on trails after dark also seems like a loser with these largely nocturnal creatures because you can't as effectively scan for them and will have more difficulty locating one if you hear it when you can't see well. In snake country, thick, high-topped leather boots are recommended and thick leather gaiters too. But the leather needs to be very thick, probably double thickness, to prevent penetration by pit viper fangs though some reports say that even clothing may help deflect a bite. That heavy boot advice creates a major conflict for us as snake-phobic, minimalist shoe fans. We believe that we are substantially less likely to sustain an injury when wearing minimalist shoes than when wearing boots because of our enhanced agility. And while we are terrified of being bitten by a snake, we think our risk of having to be hauled off mountain trail is greater if we are encumbered by hefty boots than from being bitten by a snake. Essentially no one we've seen wears proper snake boots in the SW desert and most of the park rangers wear low tops. It's all a numbers game: what are the odds of getting bitten; what are the odds that your foot wear is both high enough and thick enough to deflect a bite; what are the odds of creating other problems with gear well-suited to snake country. We know that wearing thin-soled shoes makes us more vigilant about our foot placement on the trails than the folks with heavier treads and we hope that vigilance will tip the balance in our favor in spotting a snake in time to avoid it. Ranger Amy at McDowell Mountain Regional Park near Phoenix strongly recommended hikers "leave the stick at home" when hiking and to not attempt to use it to "redirect" snakes. Having almost entirely abandoned hiking sticks because we believe they interfere with refining balance and are a nuisance when scrambling, we were happy to take her advice. But after having our own snake encounter, we have done a flip-flop. We have decided to (almost) always carry 1 hiking stick with us when we hike in rattlesnake country when they are likely to be out, though it rarely gets off of Bill's pack. Our trekking pole is carried for the sole purpose of aiding us in flushing out snakes if we find ourselves on a segment of trail with tall grasses that obscure our view of foot placement on the trail. We are so committed to inspecting each foot placement and hand hold that we've abandoned trails that have long stretches of obscured trail. But sometimes there are short segments of poor visibility trail on a route that we'll want to traverse. 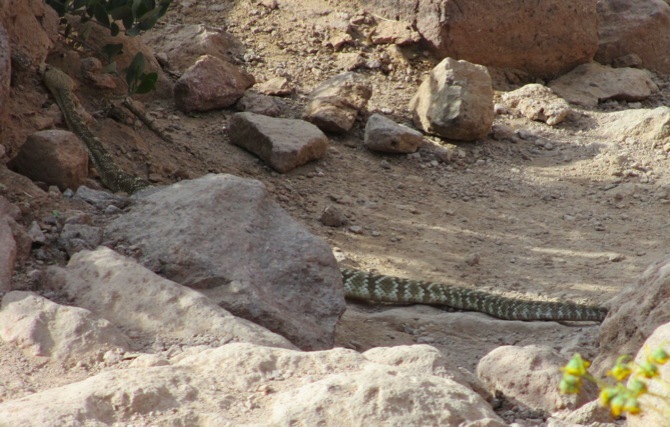 We also think about our Mojave Green encounter in regards to walking sticks: we did not want to go around the snake because the dense brush off the trail made it hard to inspect for other snakes. If we'd had a stick in that situation and he hadn't yielded, we could have used the pole to rustle the bushes ahead of us before stepping between them. Despite Ranger Amy's advice, we decided it's better to trigger the hiss and rattle with a stick than a foot. We pause & look to both sides to avoid being ambushed in narrow passageways. We've refined our routine when hiking in the desert SW during rattlesnake high season, especially on narrow, brush-lined trails. We generally walk quite close to each other so we can talk but on the higher-risk segments of trail we walk 6-8' apart to give both the leader and the follower plenty of room to react. The startle response to sighting something like a snake can have one moving without thinking, creating the risk of knocking the other person over if he or she is on your heels. And even the follower needs room to bolt ahead unexpectedly. We are on high alert when we come to a narrow, deep cut in the rock on a trail, like a mini canyon. I will often stop and carefully scan both sides before I proceed because this type of setting seems perfect for these ambush predators. Many rattlesnakes (though not the Mojave Greens) prefer rocky surfaces for sunning themselves and being bitten by a rattler at waist height or above can be especially dangerous. I also keep my hands at waist level or higher in narrow passageways for the same reason. A cell phone and car keys are considered by some as the only items you should carry in a snake bite kit because "cutting and sucking" the venom is no longer recommended. A cell phone is an essential safety device these days, so make sure yours is well charged when you head out. If you are in an area without coverage, turn it off to conserve its battery life for an emergency. If you do have an emergency, you'll want to call for help as soon as you are in range. If it is cold, carry the phone next to your body to maintain your battery's effectiveness by keeping it warm, though that's not likely to be a problem during snake season. Make a point to know where you are on the trail at all times. Unlike landlines, the 911 operators cannot pinpoint you based on your cell phone number. The 911 operators can narrow your cell phone location down, but you need to know where you are. Bill always does the hike planning but I still make a point to have enough trail names or numbers on the tip of my tongue to be able to call for help. I also am in the habit of running my stop watch when on the trails so I know about how long it took us to reach our turn around point if we are doing an 'out and back.' On the return I then have a rough idea at any given time how far it is back to the trail head. Our encounter with the Mojave Green settled our debate about paying for the satellite phone option or not on our new truck. In places like Death Valley where we stay for a week or more at a time, there is no cell coverage in most of the park. A snake bite emergency will likely mean we'll have to hike back to our truck on our own but at least once there, we can use our satellite phone to call for help in locating the nearest ER or perhaps get a helicopter flight. Relying on cell phone service in that situation might take an hour or more of driving and time matters with a venomous bite. After getting more clear about the issues surrounding a snake bite emergency, I am even more careful now to make extra sure that I always have my health insurance card and a credit card with me when I hike. Think in terms of what you'll need to get through a trip to the ER, not just through your hike. 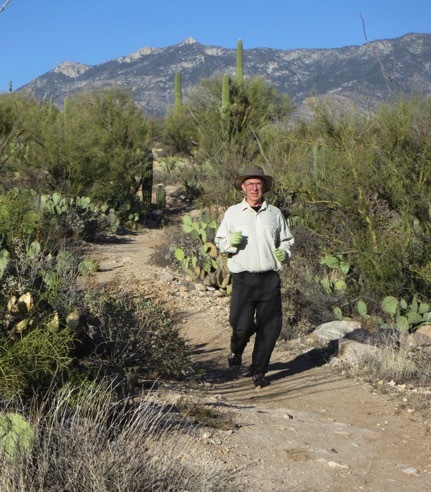 Be sure to carry and drink plenty of water when hiking in the SW desert. Within a week of our snake encounter, 3 different hiker/hiker groups volunteered to us that they were out of water and we had to wonder how many more there were that weren't mentioning it. Staying hydrated is key to being alert enough to be effectively scanning for snakes until you are off the trail and if you are bitten, being well hydrated at the time will aid in your recovery. Also, always carry a flashlight, even a tiny one, to help you watch for snakes should you be on the trail after dark, their favorite time for hunting in warm weather. Contrary to my earlier readings, the better advice is not to waste time trying to identify the snake that bit you or your companion, though personally I'll be trying to snap a photo to settle arguments more quickly. The reasoning behind not identifying the snake is that the bite pattern and symptom set triggered by the venom will be distinctive enough for the emergency personnel to establish what got you. Rattlesnakes leave puncture wounds with one or both of their fangs and coral snakes with multiple little teeth leave a messier bite mark. Mojave bites are less painful than Diamondbacks and their toxins are slower to take effect. Some non-venomous snakes do bite, so the ER staff may withhold anti-venom until the patient exhibits symptoms of a venomous bite. If it's an option, wash the bite wound with water or soap and water to decrease the infection risk. Using a pen, mark the time of the bite near the wound on their skin. As time passes and the swelling progresses, like up a limb, occasionally note the time at the current swelling line of demarcation. That literal time line on their skin will aid the medical professionals in assessing how quickly the swelling is advancing. Call 911 to get rescue help if you are away from your car and to determine where you should go for treatment. Not all ER's have anti-venom on hand, so even if you or your group drives to the nearest ER, you want them to know you are coming and that you are going to the right place. Usually you have about 6 hours to optimally begin receiving anti-venom, so plan your exit from your location accordingly. However severe bleeding problems can begin much earlier if the venom loaded with hemotoxins was discharged directly into an artery or a vein, so act swiftly. 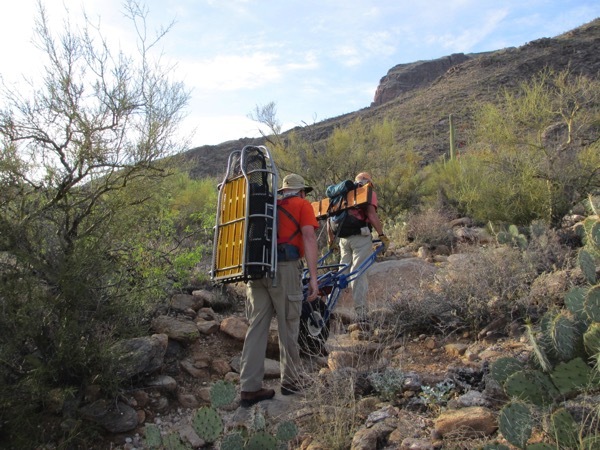 This Search and Rescue team was expecting to haul out an injured victim in the gurney. Do your best to keep your heart rate down to slow the spread of the venom and likewise, keep the bite area below your heart. If you are on a trail and are urged to walk-out, I'd personally lobby for an evacuation if it is very far. Descending a rocky trail with a snake bite that could being bleeding profusely is no way to keep your heart rate down. Evacuation could be by helicopter or a crew on foot with a gurney depending on the situation. Remove rings and other potentially constricting items that are between the bite site and the rest of your body because the area will likely become quite swollen. Placing a constricting band (looser than a tourniquet) above the bite site is prudent, but only if done correctly. I carry an exercise band at the bottom of my pack to use to make an emergency arm sling or wrap a joint and we would also use it for a snake bite but don't do apply constriction unless you educate yourself about the issues in advance. Applied too tightly, the band will make matters worse. Don't suction the bite, ice it, put a tourniquet on it, or start chugging booze. If you are waiting for help, jot down the medications you are taking, things you are allergic to, and get that health insurance card and credit card ready. The National Poison Control phone number of 1-800-222-1222 is given as another contact in the case of snake bites. Personally, I plan on going right to 911, but the Poison center is available 24/7 for both emergency and non-emergency situations, so it's worth keeping them in mind. The good news is that though rattlesnakes always inject a potent dose of venom when hunting prey, the amount of venom released is more variable when they bite defensively. As many as 20% of rattlesnake bites in humans are "dry bites" in which no venom is released (though infection is still a hazard). And some bites will only deliver a small amount of venom, which simplifies treatment and speeds recovery. A dry bite is less likely to occur with a bite from a juvenile rattler than from a mature one. Apparently the youngsters have yet to develop the ability to intentionally regulate the amount of venom released with a bite. But the good news is that younger snakes are less likely to stand their ground, so are less likely to bite to begin with. The other 80% of the time some amount of venom is injected with a bite and CroFab, the new, improved antivenom that's been available since about 2002, will be used. Unlike the old antivenom, it doesn't carry the risk of being fatal in its own right. CroFab is definitely the 'new, improved' product. Production of the old anti-venom that was developed in the 1950's has ceased, so you no longer have to worry about getting the right one. But despite the availability of anti-venom, recovery from a rattlesnake envenomation is still a hazardous journey requiring hospitalization one or more times. Is It A Mojave Green Or A Diamondback? I was relieved to finally read that the long-standing recommendation to identify the snake that bit you is bogus: it doesn't matter and you are wasting precious time better spent getting to the ER. And the more I read about the differences between just the Mojave Greens and Diamondbacks made me even more grateful because it isn't always easy to differentiate them. We were lucky: our Mojave Green was actually green, a really bright, definitive green but they aren't always. They can be brown or yellow as well. And the Western Diamondbacks are generally gray-brown but can be brick red, chalk white, yellow or pinkish so unless your rattler is green, it's hard to be sure. And of course, then there is the rare albino to make it really confusing. Both the Mojave's and Diamondbacks have diamond patterns down their backs but occasionally Diamondbacks lack the diamonds altogether. I suppose if Diamondbacks sometimes rearrange their diamonds into a finer, less distinct pattern, that there is no reason that can't happen in Mojave Greens too. They both have alternating black and white bands on their tails beneath their rattlers but it takes a properly poised snake and careful study to note if the white and black band widths are of equal size or not, which is a differentiating detail. The size of the scale on their heads is different, but again, that's not an easy assessment to make in a hurry. The Mojave Greens have a strong preference for high desert, low mountain slopes with relatively open habitats of mesquite or creosote bush, preferably in the 2,000-4,000' range. They tend to shy away from dense vegetation and rocky areas and again, our Mojave Green exhibited classic taste in habitat for his kind. Diamondbacks are far less particular and range from flat coastal plains to steep rocky hillsides, to pine-oak forests. And they also hang-out in the mesquite grasslands and sandy desert areas of the Greens. The rangers didn't believe us when we told them we'd spotted a Mojave Green because only Diamondbacks had previously been reported--that's where our photo helped out. Just to keep it interesting, rattlesnakes don't always have rattles: sometimes they are between rattles. Rattles can break-off or become damaged, and it takes time to replace them. (Check out this link if you'd like to hear the distinctive sound of a rattlesnake shaking its tail: http://en.wikipedia.org/wiki/Rattlesnake#Rattle). The more we know about rattlesnakes, the more confident we feel as hikers invading their territory but getting an answer to one question always lead to another. My latest reading suggested that rattlers may only eat once a year, which leaves us wondering why they have to be out so much if that is the case. And we are still having trouble reconciling the threat to life that the rattlers present with the local chant that "They are an important part of our community because they keep the rodents down." Hummm,1 kill a year/snake doesn't sound like very effect rodent control for the financial burden they create: 1 vial of anit-venom runs about $2,300 (from drugstore.com) and the average treatment requires 12 vials. Some insurance plans will only pay for 2 vials. I know balanced ecosystems are delicate, complex things but I still have the naive outsider perspective of "get rid of them." A snake den was another nasty image that arose with my readings about rattlers....can you imagine a thousand or more snoozing together? We worry about stumbling upon a lone snake but now we have to consider potentially encountering dozens of rattlers meandering into or out of a den. To our surprise, a den doesn't have to be a deep burrow with natural insulation but could be as meager as a south-facing rock crevice. The bit of good news is that Mojave Greens don't favor massing together with other snakes to aid in keeping warm in the winter (technically "brumation", not hibernation). Though lacking rattles, cottonmouths (water moccasins) and copperheads are in the same pit viper subfamily as rattlesnakes though belong to a different genus. Their bites are treated with the same CroFab anti-venom used for rattlesnake bites. They shouldn't be an issue in the desert SW because they favor the eastern US. What a fright to not have a rattle to warn one of their presence. Coral snakes are the only other venomous snakes in the US though are more common in the south than in the desert SW. That being said, one was spotted some years ago above Lost Dutchman State Park near Phoenix, which is where we reported the first Mojave Green sighting. Apparently coral snakes are easily confused with similarly banded, nonvenomous, king snakes. Once again, the devil is in the details when it comes to identifying them. You are looking at a coral snake if the red bands touch the yellow bands. Coral snakes prefer to hang out in leaf piles and in borrowed burrows. They have a neurotoxin and little teeth that they gnaw with. A different anti-venom is required to treat coral snake bites, an anti-venom that is in short supply because it is no longer manufactured in the US. Yes, this piece is about venomous snakes of the US SW but our encounter with a venomous adder in Europe 3 months after our showdown with the Mojave Green immediately triggered a string of comparisons. The most striking comparison is between our photos of the Mojave Green and the European adder (Vipera berus): the Mojave is holding its ground and the adder is heading out. When passersby approached the Mojave, it fortified its position with more hissing, rattling, and rising up; when passersby approached the adder, it slithered away more quickly. Mojave's have a reputation for being aggressive; adders for being timid. Both snakes will take a position for striking and hissing, but only the rattlers can add their characteristic rattle, if it is still intact. Both have potentially fatal venoms, though the adder's venom is rarely fatal. Both have wide geographic distributions and can be found on a broad range of terrains, though adders don't seem to have decidedly 'favorite' settings like rattlers do. Many rattlesnakes are especially fond of sunning on rocky prominences, which gives the hiker some guidance as to where to be especially alert. And as we learned the hard way, both are likely to be found by us in places where the locals said they don't exist.